The ACT Race twin-disc kit offers SRT-4 enthusiasts a true race-ready complete direct bolt in clutch kit that requires absolutely no modifications. The ACT Race twin disc kit utilizes sintered iron discs for maximum holding capacity (770 lbs/ft of torque) and quick shifting while also offering twice the surface area for high heat capacity and long life. Each kit has an overall weight of 15 lbs as compared to the 31 lb stock kit (a 52% decrease in weight) and results in a very low moment of inertia. With ACT’s ability to design and manufacture our own diaphragm springs, we were able to keep the pedal load to a minimal 15% increase over the stock pedal load. ACT’s Race twin disc kits are a perfect complement to an already expansive catalog of over 500 performance clutch kits and components for more than 300 different applications. ACT Clutches deliver the maximum holding power by applying a series of sound engineering advancements to new (not rebuilt) components which maximizes load and reduces flex. The result is maximum torque capacity, long life and clean, fast shifting. 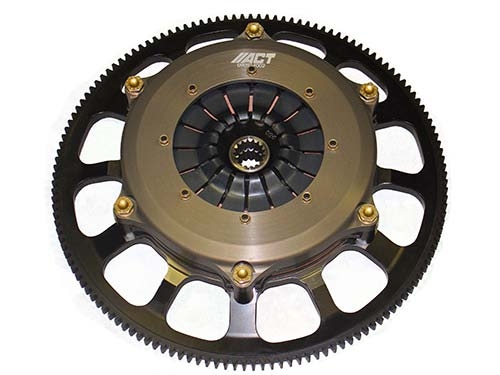 ACT is a premier clutch manufacturer, whose product line features high performance clutches and forged flywheels for the most popular cars, trucks and SUVs. ACT is headquartered in Lancaster, California.